, an eminent French sculptor, professor of the schools of sculpture and painting, a member of the French Institute and of the legion of honour, was born at Paulien, in the department of the Haute-Loire, in 1731. 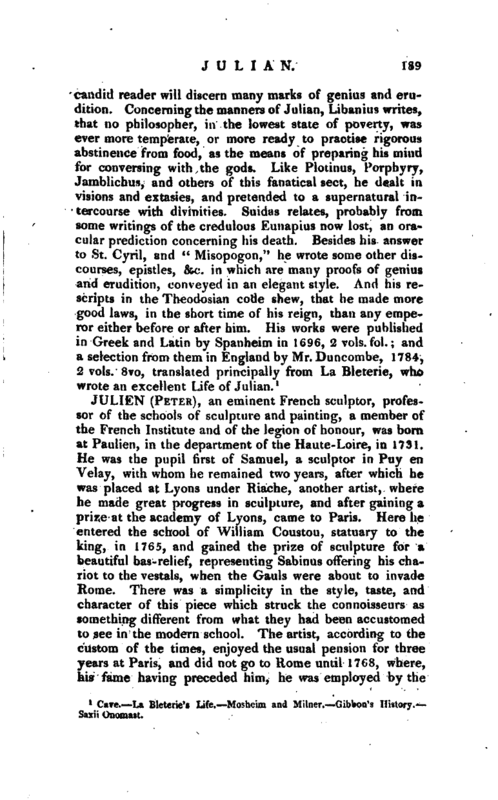 He was the pupil first of Samuel, a sculptor in Puy en Velay, with whom he remained two years, after which he was placed at Lyons under Riache, another artist, where he made great progress in sculpture, and after gaining a prize at the academy of Lyons, came to Paris. Here he entered the school of William Coustou, statuary to the king, in 1765, and gained the prize of sculpture for a beautiful bas-relief, representing Sabinus offering his chariot to the vestals, when the Gauls were about to invade Rome. There was a simplicity in the style, taste, and character of this piece which struck the connoisseurs as something different from what they had been accustomed to see in the modern school. 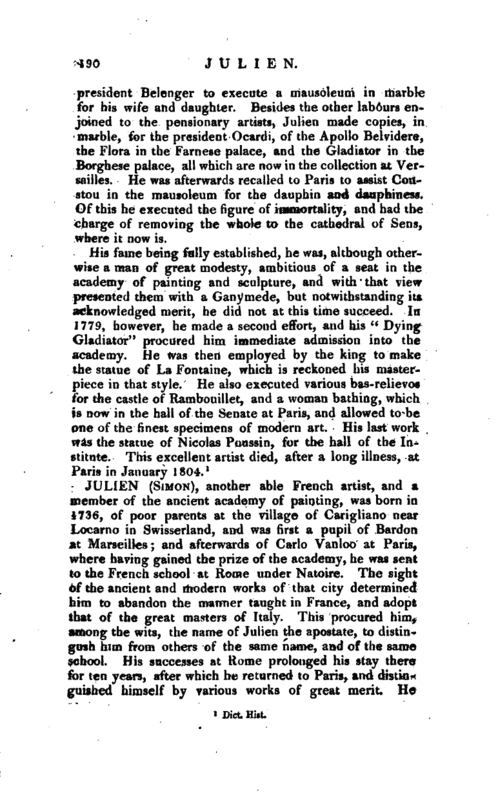 The artist, according to the custom of the times, enjoyed the usual pension for three years at Paris, and did not go to Rome until 1768, where, his fame having preceded him, he was employed by the | president Belenger to execute a mausoleum in marble for his wife and daughter. Besides the other labours enjoined to the pensionary artists, Julien made copies, in marble, for the president Ocardi, of the Apollo Belvidere, the Flora in the Farnese palace, and the Gladiator in the Borghese palace, all which are now in the collection at Versailles. He was afterwards recalled to Paris to assist Coustou in the mausoleum for the dauphin and dauphiness. Of this he executed the figure of immortality, and had the charge of removing the whole to the cathedral of Sens, where it now is.